Some will argue for New Year’s Resolutions, others against. The one argument is that people are actually thinking about their future and considering making changes for the better. The Glass-is-half-empters are citing a variety of statistics as to how few people make good on their resolutions. I sit solidly in the first camp. Even if not every resolution is kept, the process is valuable. What I have done is created a tool to help people look at the past year to harvest the lessons and learning, and use that information to project a future filled with remarkable results. 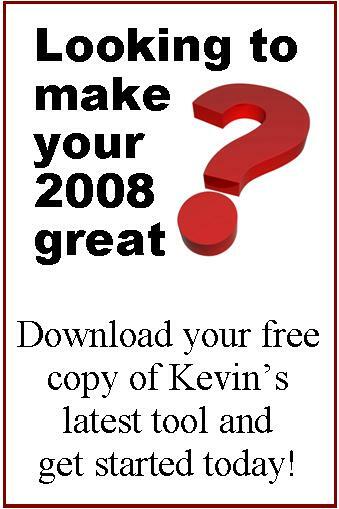 This tool is designed around 26 questions – 13 to reflect on the past and 13 to project into the future. I’ve made this tool available for free and am blogging some of my answers to these questions, one day at a time. You can learn more about this project, by reading the first post from December 18th. I will begin with the projection questions starting tomorrow. All of this activity is important for us as individuals, but as leaders we can leverage from this as well. You can take advantage of people’s tendency to make resolutions to get people thinking about the future, new actions and different results more easily during this time of year. You can also use the questions with your team to help them both learn and plan more effectively – for the benefit of them as individuals and the organization collectively. I was proud to learn that Remarkable Leadership has been named as one of the best leadership books of the year by both the Leadership Now blog and echoed by The Practice of Leadership blog. You can read the review and reviews of the other winners (it is a great list) here. I’ve always felt he was smart and talented in so many ways, and this quote from his recent interview with Charlie Rose, proves my point. I believe that Martin’s concept of undeniably good is much like my concept of remarkable. Since we are focusing in leadership (and not stand up, for example), I might have used slightly different wording. Really, though, I’d only make one addition – all of us can be remarkable if we work from who we are, not patterning ourselves after someone else, but truly becoming our own version of of remarkable. Will it require work? Of course it will – but when head towards the destination from our strengths, and move confidently knowing it is possible, our path will be easier and more enjoyable. Thanks to 37Signals for the quotation. I’ve had the good fortune to work with a consult with a number of organizations who are looking to continue to help individuals and teams be more successful. Often this takes the form of self managed, self directed work teams, participative management or high performance work systems. (Purists of one of these methods might squabble about me lumping them together, but that isn’t my focus here or ever). In my work, I see many examples of these concepts at work and working well, so I was happy to read a piece from a long time practitioner – both as a leader inside of organizations and as a consultant share his experiences and insights. Whether you are a proponent of self-directed teams or not, I encourage you to read this very insightful article by Ralph Sink called My Unfashionable Legacy. His belief is that these approaches are moving out of favor, despite their success. I’ll leave you to read the article and then ponder these questions. Feel free to share your answers in the comments. Do you agree with the author on the trend? What is the role of the remarkable leader in these approaches? This drawing comes from a great post on Rajesh Setty’s Life Beyond Code Blog. In this post he speaks of value of of moving the fulcrum. 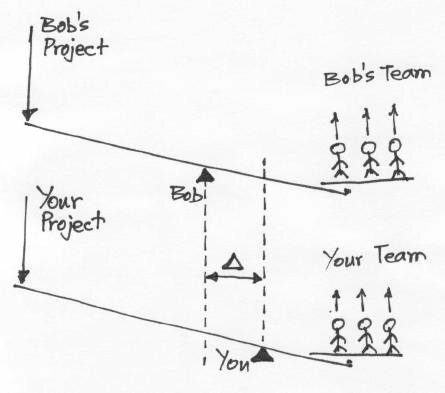 As the fulcrum of the work moves to the right (towards the team) the team is lifted higher (compard to other teams – like Bob’s) as the project succeeds. He asserts, correctly, that both the leader and the team members can work to move the fulcrum of the project towards the right. Doing this has tremendous impact on the work and the results of the team. – the work of the leader gets easier. When we let go and let the team create and succeed, the work of a remarkable leader becomes easier and the output increases. Archemedes said with a lever long enough and strong enough, he could move the world. Leverage is that powerful – and when we move the fulcrum towards the team, leverage can be remarkable. I’ll close with an adaptation of Raj’s question – which way are you moving the fulcrum?